Conservative Leader Andrew Scheer responds to a question during a news conference in Montreal on Monday. 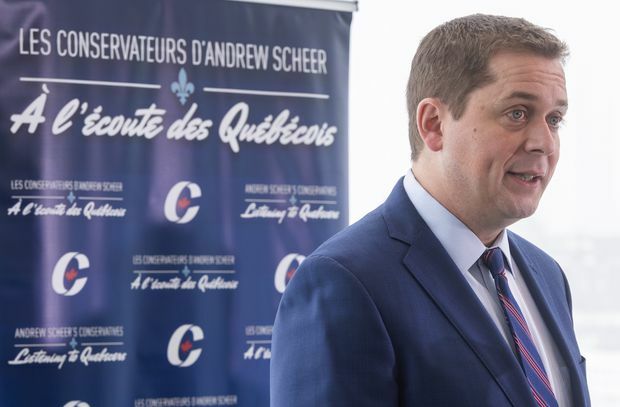 Conservative Leader Andrew Scheer says he would be open to working with Quebec to temporarily reduce immigration to the province and to introduce a values and language test for newcomers as requested by the Legault government. Speaking in Montreal on Monday, Mr. Scheer said that if he wins this year’s federal election, the Tories are willing to help Quebec Premier François Legault address his government’s immigration concerns. Quebec plans to reduce the number of newcomers by 20 per cent this year, as the province struggles to integrate tens of thousands of asylum seekers who have crossed from the United States between official points of entry. “It’s not a question of confrontation, it’s not a question of one level of government dictating or imposing; it’s a question of an openness and a willingness to work together to find that common ground,” Mr. Scheer said. Mr. Legault has said that Quebec wants to introduce testing for newcomers to ensure they can speak French and support Quebec values before increasing immigration levels. Mr. Scheer also spoke in favour of the values and language testing. “For me, it is important to have programs that help people to integrate into our society, to adopt Canadian values, to adopt one of the two official languages and to ensure that everyone who comes to Canada knows that we are a country based on the fundamental principles of equality and tolerance,” Mr. Scheer said in French on Monday. Quebec’s plan to temporarily cut the number of newcomers it accepts comes as Prime Minister Justin Trudeau’s Liberal government promotes higher immigration as the key to a stronger Canadian economy. Last November, the federal government announced it will gradually raise Canada’s national targets for annual immigration to 350,000 in 2021, from 310,000 this year. It is not clear how Quebec’s reductions will affect Ottawa’s national targets. Tory immigration critic Michelle Rempel said a Conservative government would consult closer with the provinces as it develops its federal immigration levels to ensure regional needs are addressed. “The provincial governments should have a greater say and a greater influence on setting immigration levels on an annual basis," Ms. Rempel said. Under the terms of a 1991 Canada-Quebec deal on immigration, federal funding to help Quebec integrate immigrants will rise even if the province’s total intake of immigrants declines. Ottawa estimates it will boost its annual immigration transfers to Quebec by about $50-million in the 2018-2019 fiscal year, meaning they will reach approximately $540-million (or $13,500 for each newcomer). In Ottawa, Immigration Minister Ahmed Hussen said the federal government doesn’t agree with Quebec’s plan to cut immigration. “We believe that what the Quebec economy needs, just like the Canadian economy, is more workers, more space for employers to hire more people so that they can grow the economy and create good middle-class jobs for Canadians,” Mr. Hussen said on Parliament Hill Monday. Infrastructure Minister François-Philippe Champagne also called on the Quebec government to reconcile its position in favour of lower immigration levels to the widespread calls in the business community for help to deal with continuing labour shortages. The two governments will meet in Gatineau later this month to discuss Quebec’s proposed immigration cuts and a compensation deal for costs related to resettling refugee claimants. More than 37,000 asylum seekers have entered Quebec between official border crossings along the U.S. border since January, 2017, putting significant pressure on the immigration system. On top of the annual immigration transfers, the Quebec government is seeking $300-million in compensation from Ottawa, but Mr. Legault said Ottawa is offering to cover only $140-million.